Most ‘smart’ battery applications today are limited to portable electronic equipment, and the electronic circuit is built right into the battery pack. In applications where larger ‘smart’ batteries are needed, such as electric wheelchairs, scooters, robots and forklifts, the electronic circuit may be placed in a box external to the battery. The main benefit of adding intelligence to the battery is to enable the measurement of SoH and reserve energy. Most measuring devices used are based on voltage, which is known to be highly inaccurate. Cadex is extending the ‘smart’ battery technology to wheeled applications. Called the Cadex Fuelcheck™, the device is based on the tri-state fuel gauge described earlier in this section. The system consists of a controller, current measuring device and a display unit. The Cadex Fuelcheck™ device can be added to new equipment when it is manufactured and can be installed in existing equipment as a retrofit. The installation is permanent and each wheeled appliance requires one system. A tri-state linear bar graph consisting of colored LED’s would be the preferred display for a personal user, such as a wheelchair operator. By replacing the light display with a digital readout, additional information can be shown. For example, a display could indicate the remaining runtime based on the average power consumption logged. Corrections would be applied if the load factor changes during the course of the day. Figure 77 illustrates a digital fuel gauge using the LCD panel. To initialize the Cadex Fuelcheck™ system, a one-time setup procedure is required. A PC will prompt the technician to enter information such as battery chemistry, desired end-of-discharge voltage, Ah rating of the battery, and designated service flags. The system is then calibrated by applying a full charge, followed by a full discharge. The initial discharge assesses the battery, or learns the performance. The SoH readings will be known after the first full discharge. 7-7: Cadex Fuelcheck™ digital fuel gauge. 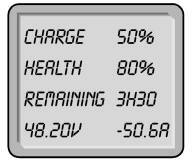 The display indicates SoC, SoH, remaining power in hours, the voltage and current draw. The simplest way to discharge the battery as part of calibration is to run it down through normal use in the equipment. The most accurate readings are obtained by using a load bank. Such a device may not be always available. With a data logging option built into the system, the PC allows downloading service data that have been collected during use. Such information would benefit large equipment fleets and rental places that need to check the performance of the batteries on demand. Similar to other ‘smart’ battery systems, calibration will be needed once every 6 to 12 months. More frequent calibrations may be required if the equipment is used for short durations between each recharge. The most practical way to calibrate the system is by occasionally allowing the battery to run down through continued use. Information relating to the date of the last calibration, or an early call for calibration if certain conditions occur, can be calculated and displayed. Knowing the SoH of a battery at any time and scheduling timely service or replacement is a major benefit for industrial battery users. Such a system would be especially helpful for organizations in which different individuals use the equipment and no one is given maintenance responsibilities. Equipment rental places fall into this category.